Duke’s new alumni center will be a state-of-the-art home for alumni when they return to campus. 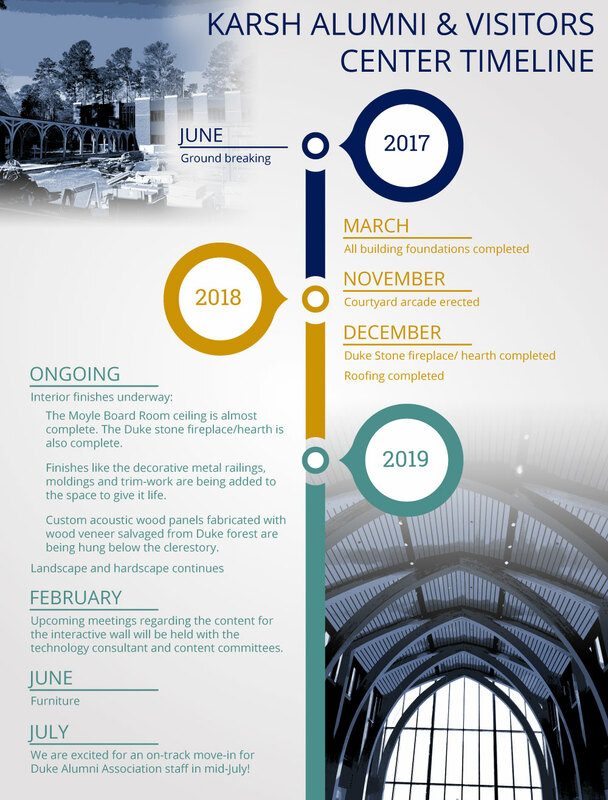 Situated at the main entrance to campus at Chapel Drive and Duke University Road, the center will include event space, meeting rooms, offices and Duke-themed exhibitions and displays. Construction is underway, with completion expected in summer 2019. **Please note policies and procedures regarding space availability and reservations for the KAVC have not yet been finalized; please refrain from reaching out regarding reserving the space at this time. Thank you. In 2009, the Office of Alumni Affairs was named the "Forlines House" in honor of John Forlines '39, former university trustee and DAA president. Since then, Forlines House has been synonymous with the Duke Alumni Association. When construction began for the new on-campus location for the alumni association, it seemed natural to bring the name with us and re-dedicate the historic home in honor of John Forlines. The new Forlines House holds offices for high-level Duke Alumni administration and the alumni admissions team. There will also be a library and an alumni lounge for intimate gatherings and meetings. An office building housing Duke’s alumni affairs staff.